A navalised version of the Su-27 for carrier-borne operations. Su-33KUB: The Su-33KUB (Korabel'nyi uchebno-boyevoi) is the latest twin-seat (side-by-side) shipboard development of the Su-27 family. Fitted with dual controls, the aircraft is suitable for training or all-weather combat tasks. First flight took place on 29 April 1999. 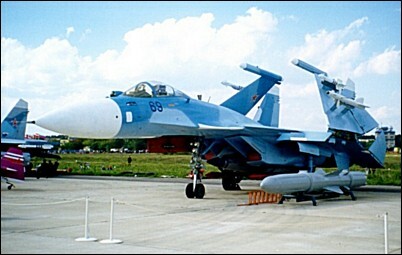 The aircraft incorporates interesting improvements over previous Su-27 derivatives. The so-called 'smart' (intellektual'noye) adaptive wing is redesigned and is of larger area. New control systems result in almost completely automatic navigation, flight, powerplant (two navalised AL-31F with thrust vectoring) and combat regimes. Crew workload is much reduced, and the glass 'dark' cockpit is equipped with colour flat-screen displays. The Su-33KUB is the first Russian aircraft to have an onboard oxygen and nitrogen generator, designed (as with other improvements) to reduce dependence on ground or deck facilities. Future use of Su-33KUB is not restricted to shipboard operations. Its high power-to-weight ratio gives stort take-off and landing (STOL) performance on minimal landing strips and the folding wings permit storage in standard aircraft shelters. REDSOUN TYRES Having started as a Company catering to the Aerospace industry, we have now emerged as a Trusted Name for Aircraft Tyres. With our business web extending to all Five Continents, we can assure you the supply of various tyres for Commercial and Defence Aircraft. We at REDSOUN TYRES strive to etch a new sales mode with competitive advantages by offering wide range of quality tyres for Russian Aircraft. REDSOUN aircraft tyres are designed to deliver outstanding performance, keeping in mind the heavy work environments in which the Military jets operate. We endeavour to put forth a new quality level in Tyre production which determines a higher level of efficiency by optimizing the product portfolio. To achieve this, we use imported Rubber of very high quality, to produce hi-tech macro-molecular material that ensures excellent features like High Abrasion and Ageing Resistance, Extra Loading Strength, dependable Performance. The Military Jets MiG-21, MiG-27, MiG-29, SU-22, SU-24, SU-25, SU-27, SU-30, IL-76, IL-78 are all-weather, multi-role fighters, meant to gain air superiority; besides, these jets operate in various conditions like take-off from unpaved runways, delivery of heavy loads to undeveloped areas in remote locations. The choice of aircraft tyre is very critical, with due consideration to Reliability and Performance. REDSOUN tyres are manufactured with advanced production techniques, using the best quality raw materials to afford extended life through many extra landings. The salient features of latest innovation and expertise are incorporated to produce tyres that deliver outstanding performance and extended life on the runway. Design and construction are meticulously done to be used in extreme conditions and for longer use preventing early replacement. REDSOUN Tyres are engineered to be light, yet strong and long lasting by resistance to wear and tear. The important factors critical to ensure Reliability and enhance Performance are expertly woven into the production profile to optimize the Quality. Hi-tech mix of Rubber compounds are used to effectively achieve the goal of producing Tyres that offer extended life with ultra-high Performance. Casing is designed to withstand external effects and extreme conditions, ensuring balanced lateral stability and uniform distribution of stress during high speed take-offs and landings. Excessive Loads and Extra Stress are well handled by the Casing Plys to provide Strength and Stability. The Tread Grooves are specially crafted to build Stability and Safe hold, along with Durability and Dependability.